This year it finally happened. The threat had loomed for a while but when the time came, it kept coming. He proved the next two times we played, that his victory wasn’t a fluke. For about four years now, my 17-year-old son and I have had a regular hit of squash up at our local RSL gymnasium. Up until this year, my title was unchallenged. I’m a bit old school when it comes to the debate about whether you play full tilt or let your kids have a chance against you in competitive games. Especially with our squash games, I have always shown no mercy. And when his turn came, neither did he. You wouldn’t have seen it on the back page of your newspaper and it wasn’t the lead story in Sport on the evening news but, in June this year, whilst still 16 years old, Jack beat me 3-2 in a fiercely contested game of squash. He lead 2-0 and I clawed back thinking, “I’ve got him” and then, the rest is history - he allowed me only two points as he finished his dad off in the fifth game. I thought, “Right... next time, I’ll get him back”. Well, next time, he beat me 4-1 and then for good measure, he got the same score the time after that. There was a definite pattern emerging in the way our games were going. You hear about how the lion packs in the African Savannah working out who is the boss lion... the old lion often sees off some early challenges but eventually the young lion wins a fight and becomes king of the pride. During that first loss, whilst scrambling to try and maintain my title, I could see that he was bringing a new strength and pace to the game that I couldn’t match. Promise you, the fight went to the last point but when he won, a wave of pride washed over. He had done it... gone past his old man. This was a treasured moment. Everyday life goes on. Then something happens that marks a moment in time. Our kids have got to a new stage. These moments don’t have to be contests. It can be a moment you become aware of sometime after a new change has occurred. My oldest Amber provided one of these moments this year, along with my mum. Amber actually stopped being a teenager this year (by virtue of turning 20). Life is flowing for her: just finished second year university; she’s recently done some house-sitting for friends; she has got herself a great steady part-time job and now, is driving her own car. She has been forging her own independence. Somewhere along the way, I heard my mum start a sentence that will probably read as fairly ordinary to you. Mum and dad are still in the same house I grew up in. We are now on the other side of town. Mum started “When Amber popped in again the other day...” Like I said, this would seem somewhat innocuous to you but as Amber’s dad, me and her mum have always driven her over to see my mum and dad. Now she was popping in, of her own accord, after uni. When she house-sat, she was closer to her grandparent’s house than to ours. Mum explained that Amber had been coming to visit just to say hello. Over the visits, an idea Amber has for a family film project grew. Amber is lucky enough to have a memory of mum’s parents - her great grandparents. My grandpa died in 2002 when Amber was nine. She remembers this kind old man who had lived a tough life. Grandpa grew up in the Depression. He was orphaned and built a life with his own family from this starting point of adversity. Amber is fascinated by her great grandfather’s story. She has developed a passion for documentary making at university. At a recent family gathering she asked everyone to be ready to share their memories of grandpa sometime soon on camera. Mum told me that she had shared things with Amber that she can’t recall telling me or my brothers or sister. Mum said it was easier to talk about when she was growing up to her grand-daughter. My daughter who it seems, just a second ago was a little baby I could hold in one arm... now has her own adult connection with my mum. It is their relationship. Amber’s got her own independent, creative ideas. Of course she has. It might read as obvious but when mum said, “When Amber popped over again the other day...” the sense of another wave of pride washed over. A treasured moment had visited again. Almost invisibly, another stage in your child’s life is progressing to a point where some time soon, you’ll be right in the middle of a treasured moment. You’ll feel it right there and then – perhaps being delightfully confronted by the realisation that they have gone past you, like the young bloke did destroying me on the local squash courts. Maybe you’ll become aware sometime after the event - like I did with Amber – realising, “wow she seriously is a young adult now... she has an impressive generous imagination... she has her own family connections that she can pursue. Sure, we drive each other crazy. We get things wrong a lot of the time with our kids. But hey, our kids surprise us. They can delight us with a treasured moment that says, they are on the way to being their own person, a young adult. This story is posted on the last day of 2013. This is a good time to look back and wonder... where were those treasured moments for you as a parent, as a mentor to a young person? Give yourself a bit of Time & Space to wonder at the magic of your kids growing up. If you would like to be notified when a new story goes on this blog, you can join the Time & Space Community right here. Thanks for reading this year. As always feel free to write a comment in the space below. There are a few ways you can comment - if you choose anonymous, it is always appreciated when you put your name next to what you say. Have a grouse 2014. Some Time & Space Community people might know that Mem Fox’s picture book (illustrated by Julie Vivas), Wilfred Gordon McDonald Partridge gets a run in some of my presentations. It‘s a personal favourite. 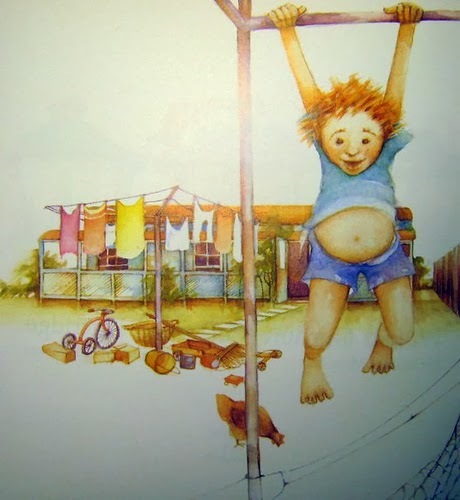 It is a story of a small boy who helps his ninety-six year old friend, Miss Nancy Alison Delacourt Cooper, in the nursing home next door to his house. I love the way he takes action to help her because she has lost her memory. Through November I was in the UK delivering some Time & Space programs there. I flew out on Melbourne Cup Tuesday. Our family had been away for the weekend and I knew something bad had happened in the Philippines... a massive storm but I had my head down whilst delivering the programs in England and never really took in what had happened. The morning after returning home Lisa sent me up the road to buy some milk where I bump into Gurdeep, a friendly bloke who works at our local IGA store. Gurdeep I think is a Sikh. He wears a turban, a beard that would make any inner city hipster proud and always, a big smile. “When is your band playing next?” asked Gurdeep. He was referring to a band I’m in called SHeD, a bunch of four dads who met up years ago when our kids were at the local primary school. Our by-line is Four Blokes and a Guitar and we practice in my shed. We play occasional Saturday mornings outside the ‘Miller-on-Gilbert’ shops to create a vibe that emphasises the difference between a local precinct and a monolithic retail centre like Northland. The local traders chip in a few bucks and when people go to offer us some busking money, we say “This is a gift from the traders, spend your money in their shops”. It works well but be assured, none of us have given up our day jobs. I tell Gurdeep, “We’re playing this weekend.” Gurdeep is a big fan of any rock’n’roll - he appears at the front of the shop, clapping along if we are playing Holy Grail or a big Elvis Presley tune. “We’ve had the little kid play out the front here... have you heard about the kid?” Gurdeep asks. “No I haven’t mate, I’ve been away,” I respond. “ He plays his little guitar and he’s been in the paper.” It is clear Gurdeep has been captivated and is excited. So Saturday comes and Mungo is walking on the other side of Gilbert Road. He lives with his mum Kathleen and Dave, his dad in one of the shops converted into their home. Mungo sees that SheD are playing out the front of Menuki Hairdressing across the road from him. 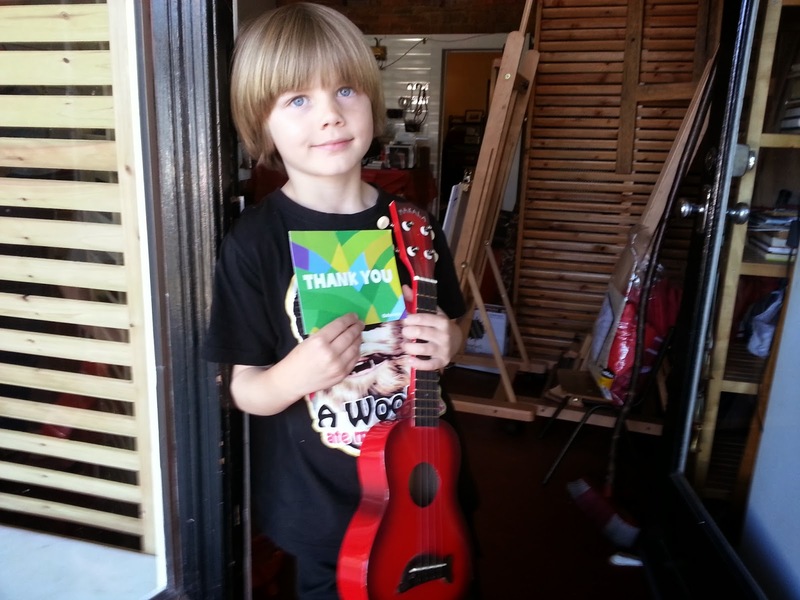 He pops back inside and appears with his ukulele in one hand and a newspaper article in the other. Our band have watched him grow up through the years... he has always stopped and listened to the tunes. He is a serious, reflective little guy. This time he played along with us. He knows two numbers, House of the Rising Sun and Ob-la-di, Ob-la-da. Our guitarist Stephen, follows Mungo and we sing along with him. Here’s the back story. Mungo and his parents, were sitting at the dinner table and chatting about a story that dominated our news services in early November. Just like Wilfred Gordon, Kathleen says, “he is always asking questions” and his dad had been listening to the ABC news on the radio for the developing consequences of Typhoon Haiyan. It captured Mungo’s attention. As he asked more questions and talked with his dad, he started to imagine and understand simple comparisons about things we might overlook. Mungo wondered what it might be like to lose all his toys. He also wondered if there was something he could do about it. At the dinner table that night, the idea that Mungo came up with was that he might be able to busk, playing his ukulele for the people of the Philippines as he once had made about $8 playing out the front of his shop front home. Dave, his dad explained about Oxfam, so he made a sign to that effect and people chipped in. Next Mungo was allowed to play outside the IGA. Oxfam heard through Mungo’s dad what he was doing and they gave him a temporary blog to track his goal towards raising $500. From there the photographer headed down and took some shots for the Herald-Sun story. 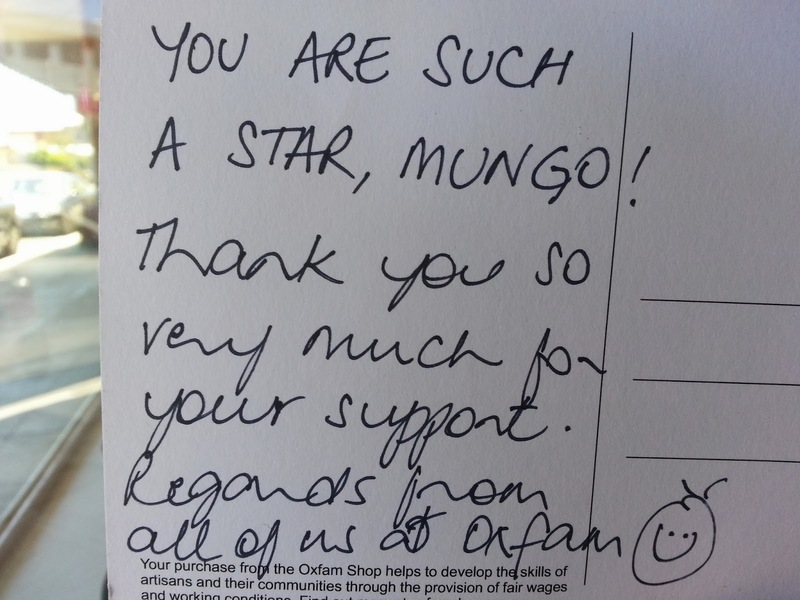 Mungo has just finished in Year 1 and as the Oxfam website states he has, in recent weeks, “shown you are never too young to be a role-model”. Kathleen says that his Principal called him up recently at the Prep, Year 1 and 2 assembly and he started telling the Preppies that “a typhoon is like a really big whirlwind”. The school are having to review their policies as well as Mungo, as a Year 1 isn’t old enough yet to go on the student social justice committee! The next shop is Glo Beauty and as I tell Monique behind the counter, Mungo’s story, a lady who has just had a treatment is standing next to me, ready to pay. The lady’s name is Margaret, she hears about Mungo’s efforts and pulls twenty bucks out of her purse, hands me the money and says “give it to that wonderful boy”. Mum, Kathleen who is Mungo’s blog manager credits Margaret’s contribution. Mungo has well and truly surpassed his $500 goal and as I write the growing total is $3042 AUD for Oxfam. You can check out the current total here, even add to it if you wish. Mungo, this is mighty. by a small boy, who wasn’t very old either. This post is sent out at Christmas. It doesn’t matter if you are religious or not – Christmas has a huge theme of giving. The story that underpins Christmas has central figures who were homeless on that night – as the nativity narrative goes, the baby was born in a stable at the back of the inn with the ‘no vacancy’ sign... there are people right now, still homeless in the Philippines. Just like Wilfred Gordon I reckon Mungo has helped us to remember what’s important. His story has sparked the kindness in other people’s hearts... his action has been so profoundly simple that it has been easy for people to support and join Mungo in his cause. It is a powerful little example of how one person’s action can make the world a better place and on this occasion that kindness has come from Mungo... who isn’t very old either. As always, thanks for reading - feel free to add your comments in the box below. You can click the Anonymous link to write a comment. It is always appreciated if you include your name next at the end of the comment. If you would like to join the Time & Space Community - it is a gift to you and when a new story like this one is posted, you will receive an email about it. Here's where you can become part of the community. From the day this story is posted consider how time has moved since these two events. It is 42 days since Adam Goodes was called an ‘ape’ at the MCG by a 13-year-old girl. It is 44 days since Private Lee Rigby was hacked to death in Woolwich in the UK. If you read this blog in Australia, the Adam Goodes story preoccupied the nation for about a week. With regard to the Woolwich story, it doesn’t matter where in the world you read this blog... you would have heard news about the murder of Lee Rigby. Do you ever feel naive when the media circus, pulls out the tent pegs, packs up and heads away in search of the next story? I do. The fervent discussion on talkback radio, the collective introspection that goes with big news, evaporates as quickly as the storm brews up. What enables us to be different the next time? I reckon it is the moments of chance learning we get that don’t make world news. My daughter Amber and I have been going to the footy for years. Her younger brother has come along with us most of that time but on this Saturday night, it was just me and her. Just like when she was little. Our team Essendon had won. We had beaten the Tigers in the big Dreamtime match at the MCG. We walked through Fitzroy Gardens to get to our tram stop. We talked along the path. Both of us agreed that there was something unusual in the atmosphere that night. The crowd of over 80000 people had been noticeably quiet. The Dreamtime game is meant to be a celebration of the contribution of indigenous players to Aussie Rules. But something sad had happened at that ground on the previous night. Something that didn’t fit the script. That was the night Adam Goodes, an aboriginal champion of the game, had been racially vilified during the final stages of the Collingwood-Sydney game. Amber and I both wondered if that rupture, on the same ground, had placed our crowd into that subdued, reflective state. That week, I had been working flat stick and only caught snippets of the brutal murder of a British soldier, in the broad daylight in a London high street. Having only snippets suited me, in a way, because this attack felt new. It was disturbing and hard to let in. The Lee Rigby story also brought up a familiar sense of anxiety, uncertainty. It is irrational and a bit embarrassing to say but I felt afraid. I remember feeling the same way after September 11. We got to tram stop near St Vincent’s Hospital. Well, when Amber was six it was a tram stop. These days it’s called a Super Stop. That distinction is made because we had to top up our Myki cards. That meant I had to open my wallet. It was getting late so I scanned the characters waiting at the super stop. There were two aboriginal women who walked up to the stop and past us. One of the ladies had no shoes. They were pretty tipsy and happy. A sad scene but their jovial, boisterous ways made me smile. There was a familiarity that didn’t feel threatening... I had seen this before. A man was sitting right near the Myki machine... he had darkish skin too but I was pretty sure he wasn’t aboriginal. He had a vacant expression on his face. He was looking forward and not giving even any fleeting eye contact. I felt uncomfortable as I started to put my credit cards on the Myki machine to top up my card. I’m placing myself here at your judgement but a friend of mine says that if we write, we have to be prepared to share something that we don’t like in ourselves... something from the shadows, something that might even disgust us about ourselves. This reads pretty heavy I know but put simply, I was frightened of this man. I wondered if he might be muslim. Specifically, an extreme Islamist. So, Amber and I (and my irrational thoughts) got on the tram... with this man. We found two seats in a booth with a couple who had come from the city. The man I was frightened of took his seat a couple of booths away taking one of four seats on his own. The aboriginal ladies lit up the tram with laughter and got off two stops later. Next our attention turned to some young blokes who also had had a few drinks. They weren’t full hipsters but tertiary students with a lot of young fella confidence and bits of facial hair... they enjoyed the mix between their intellectuality and their ripe language. They were making outlandish, bravado fuelled remarks about the young women they knew... very loudly. Their demeanour was so overconfident and so loud and so oblivious to the rest of the passengers that they were actually quite amusing. The other two people in our booth, a man and a woman were smirking. These lads were very happy for themselves. If on the other hand, my paranoid profiling of the man sitting on his own was indeed correct and he was an extreme Islamist, then these young blokes had done nothing to argue a case in support of the modesty and decorum of the infidels! They were pretty crass. In a couple more stops they were off, congratulating each other as to how funny each of them really were. This was such a typical Friday night tram ride home along Brunswick Street... a classic mix of footy crowd along with others coming back from the restaurants and pubs. Two stops later, a lady was giving a warm hug at the stop to two friends she had dined with. Well dressed, middle aged, Caucasian and attractive looking... she got on the tram, waved and blew a few extra kisses to her friends. Another tipsy person was with us. The tram took off with one of those jolts that could throw you off balance if you were fully sober. The lady was flung in a pirouette... she did a full 180 degree turn, flung out her hand, grabbed a rail, swung again and fell, into the lap of the man I was afraid of. “Oh, how are you?” said the well dressed, tipsy lady. She remained on the man’s lap longer than she should have. Somehow he managed to assist the lady off his lap. She slid and slotted into the space next to him. There was room for her to create some space, move and take the seat opposite but she sat snuggled right in, in a flirty fashion. The lady looked around the tram and saw a few footy scarves adorning some of the passengers. “No I have been working tonight in the city,” he replied, “I did see the score at about half time.” The man’s accent was hard to place... middle eastern maybe? Maybe not. His voice sounded kind. My fears was dissipating and being replaced by a feeling best described as foolishness. “Oh, who was playing?” the lady asked. “I know Richmond was one team, I go for Richmond but I think we might have been losing.” Wow. I thought. This extremist guy goes for the Tigers. “I go for the magpies... that was bad what happened to Adam Goodes last night – are you aboriginal?” the lady asked very forwardly. “No, I am from Afghanistan,” said the man. “Oh, are you a muslim?” asked the lady. The man was very patient. He answered every question the lady asked him. We were witness to a fascinating conversation. The gentle way the man’s intuition summed up that the lady was tipsy, and meant no harm, gave her permission in turn to take the conversation deeper and deeper. We heard her talk about a documentary she had seen that week on TV. She connected it with the murder of the soldier in London – the program was about Islamic fundamentalism. We heard how his particular tribe in Afghanistan had been a happy group of people. He remembered untroubled times when with his tribe, there was singing, dancing and regular celebrating. Then the Taliban came. They took some of his friends, and then his brother-in-law. They learnt that all of them were killed. When he was a teenager he came to Australia. Because of the danger... because he is now ‘Australia’s responsibility’, as he put it, he can’t go back to Afghanistan. The only way he can see his family is if they come to the border and cross into Pakistan. He had managed to do that a couple of times, we think we heard him share with the lady. The couple got off the tram and it wound around into Miller Street. The man kept talking and shared that eventually he wants to bring his mother and family to Australia. The tram got to the Gilbert Road turn and the lady said, “This is my stop, I need to get off.” She sounded more quiet now. “It was wonderful to talk with you. Nice to meet you.” A simple statement of gratitude by the man. Two stops later it was Amber and my turn to get off. We walked down the side street to our home in West Preston where we have lived in peace for all of her life. “You just never know what you’re going to get on that 112 tram, do you dad?” Amber remarked. “Very true Amber,” I replied. And quietly I thought back with some embarrassment to the way I had painted the man as a potential threat. I didn’t feel frightened any more. I had heard his story. I felt grateful to have heard the man’s gentleness. I think it affected everyone within earshot of him on that tram ride home. All I can say is that I hope his dream comes true. As always feel free to respond in the space below. If you don't have a Google account, you can sign in as 'Anonymous' - always appreciated if you put your name next to your comments. If you wanted to join the Time & Space community go to this page of the website and click on the link. In today's Age Sarah MacDonald mentions the popular show The Voice in passing reference to the reality that a lot more families now, are probably eating on the couch in front of the TV. The reason that is significant is that The Voice is the focus of the other article by Wendy Squires that appeared in the same paper this weekend past. So, let's start with eating together at the table. Last night I presented, at what would be dinner time, nine things I know to be true at a presentation called How to Stay in Touch on the Adolescent Roller Coaster. I have always wanted to say "eat at the table together" in my presentations... but really, in practice, if your house is like mine, it is pretty difficult to achieve that on even one night of the week. MacDonald's article is liberating because I acutely feel that guilty should of eating at the table as a family more often than we do. The article is also confronting because she pulls no punches in asserting that "the family dinner is an archaic ritual that's almost dead and buried". I'm not sure I want that to be true (and, in fact she says that too later in her discussion). The reality is that most weeks we just don't make it to the dinner table... Lisa and Amber have their fitness classes, I could be off doing a Time & Space program and the young bloke has soccer training on Tuesdays and Thursdays. This Friday night, Lisa gets her weekly night of curling up on the couch with a book, as the remainder of our mob, traipse to the MCG to (hopefully) see the Bombers fix up Carlton. When I got home from the presentation last night, there was no tea left (in an earlier version of this post I overlooked mentioning that Lisa sorted out a quick home made pizza! Oversight now corrected!) The young fella, who had gone to bed, had scoffed the last of the cannelloni. Lisa had been hoping there would be some left for her lunch at work today, let alone my dinner. My daughter's boyfriend was over. They were watching Game of Thrones (no spoilers - promise). I asked how everyone's night had been and what they had been up to. Lisa explained that everyone was in the lounge room at the same time when The Voice was on. Whilst I wasn't there for last night's episode, I could immediately picture the other four and what they probably were doing. We all talk over each other. We all shhhhooosh each other. We take on our roles, our commentating perspective. The young bloke likes to sit on the couch and kind of bag it... the over-the-topness of Seal. We laugh at how how Ricky keeps saying, consolingly, to every departing contestant that "you already have a career" - surely Ricky, the music industry is going to be pretty crowded if all of them make it! The Voice equals fun times for us as a family. At a deeper level, Wendy Squires makes an excellent observation about The Voice as representative of another modern evolution... we are seeing more and more fellas, expressing their feelings. Gender studies have a name for this - expanded masculinity. What defined a boy or a man is definitely far less narrow than back in the day. A final take is that my colleague Michael Grose talks about 'down-time' or 'mooch-time'. This is that slouching on the couch time. I reckon it pretty vital for families who are on the go at 21st Century pace. Whilst we mightn't get to a shared meal at an actual table as often as we feel we should, there is value in making sure that we get enough along-side, hanging out time with each other where nothing much is happening. So have a read. These are thought provoking commentaries. Are you shocked that I have outed my mob as having dinner table deficit disorder? Do you have TV time where the heckling drowns out what is beaming in to your living room? What are the things that truly help your tribe to stay connected? What do you think about what Sarah MacDonald and Wendy Squires have to say? As always, feel free to join in the discussion in the comment box below (you can actually just select 'anonymous' if you don't have a Google Account and if you are comfortable, it is always nice to see your name next to your comment). Here is the Sarah MacDonald family dinner article. Late last century, a network of Melbourne boys’ schools were each asked to send a senior student, one of their finest, to an education conference. The organisers had dreamed up a heady topic, ‘Boys’ Education for the New Millenium’. Mark, a friend and mentor of many years, had phoned me and asked for some help in developing a youth panel session. He wanted authenticity. He wanted the true insights of these young blokes. I’ve been to plenty of education conferences where the ‘voices of the students’ section is wooden and cringey. It wasn’t like that with this group. In fact they were of such calibre that the facilitation was easy. The memories of that project have come flooding back in the last 24 hours for a specific reason... but more on that in a moment. Mark and I felt we needed to get the fellas talking to each other and we wanted to give them time to consider what they might say on the panel. So a couple of weeks before the event, we took them off to Matteo’s in Brunswick Street (and yes, being seventeen, eighteen year old boys, they smashed down three large courses each). I knew the pressure was on for this group of kids to come up with something outstanding when I saw the bulging eyes of the conference organiser fixing on the bill! He need not have worried, the chats over that dinner were a privilege to be a part of.... We asked them: what fires your spirit; who inspires you; what is your passion and what have been the instructive moments in your life, both the euphoric and tough times. We wanted to hear their stories and the group of young men did not disappoint. Mark and I knew by the time our meal had concluded that it was money well spent. “All my life, I have loved music,” observed the young man. He was captain of his school. I remembered thinking at the time how great it was that his peers and teachers had picked him. Boys’ schools have worked really hard in the last couple of decades at expanding the previously narrow concept of what made you a good bloke, an acceptable male. How good is it that a musician, not the hero of the first XVIII, was school captain. The young man continued to tell his story. I remember his eloquence on the panel and how he impacted on the audience of adults. Looking out, you could see how struck they were with the clarity of his dream and how it had been unhindered by his important people. It is nearly fifteen years ago, so the memory of his exact words is not here. The sentiment is. My mum and dad have always taken my dream seriously. I love what I feel when I make music. It is what I want to do with my life and my parents have always just supported me in that dream. Never have they suggested another, safer path. The young man made an impact on me and his story helped to confirm a hunch I have always had... that if people, particularly young people, know what they want then the momentum of their motivation becomes an unstoppable force. When the dream is pure and fuelled by loved ones who cheer for the young person, when there is no clash of ambition between the elders and the young dreamer, then anything can happen. Why do I know this? Because that young man just won three Grammy awards. Back in 1998 he introduced himself to the group as Wally. His full name is Wouter (Walter) de Backer, known to the music world and his fans as Gotye. Thanks for giving yourself some 'Time & Space' to read this. As always, feel free to write your responses in the space below. It was one of those times where the internal prompt to just step up and say ‘thanks’ was strong. David had offered something very simple and, at the same time, brilliant the day before. A conference for people connected with boys’ schools from all around the world had just closed and as delegates were leaving to return home, there was only this moment to be able to express that gratitude. “David, I just wanted to say ‘thanks’ for your workshop, there were little corners of gold around this conference... I’m so fortunate to have chosen yours,” I say to the smiling, Deputy Headmaster from St James Independent School for Boys in the UK. I am wanting to connect because David had made a deep impression the day before. Have you ever been met by an atmosphere of calm when you go into someone’s space? I felt this calm surround me on arriving at his classroom workshop. Half a world away from where David and his two fellow presenters teach... these gentlemen, our workshop presenters gifted us a one hour window into the quiet stillness that is the foundation of their school’s ethos. The wish to connect comes from the excitement that for about a year now, your blogger has been trying to start each day with some quiet stillness, some meditation. Can’t say I’ve done it every day but I could let David know that I have had a go at this for more days than not. It was exciting to share how when a number of ‘days in a row’ were strung together, I have felt real benefits. David’s headmaster (another David) had explained the day before that his deputy had been practising stillness twice a day for over twenty years. David is kind and affirming throughout our brief chat. “Well done Bill, with a year under your belt you are an expert in the practice!” There’s a depth of attention and sincerity, real interest. “On the days when I have practiced the stillness, and a moment arises where my son is just ‘doing his job’ as a teenager and me, as his dad – he’s pushing and I’m holding, a boundary, I get that vital, extra ‘half-a-second’. Time seems to slow down and it feels like I get the chance to choose my reaction, in that brief moment, and, much more often than on the days I do the stillness practise, that choice turns out to be a good one. As I look back at that brief interaction, I marvel at the story that David shared about an exercise called ‘The Pause’. Twice a day, the whole school stops... teachers and students alike and they become still. Below, if you are seeing the actual blog, my recollection, is on YouTube, of what David shared with the people in that workshop. Just so you can get it in writing (in case you can’t open the link now). Here’s what you do if you want to pause each day, indeed right now. Read the instructions that follow in full (because after step 1 you are asked to close your eyes. 1. Bring your attention to your sense of sight – look around where are, notice the colours in the scene around you. Hold your head still and stretch your eyes as far as you can to the left and the right and notice what you see. 2. Close your eyes and bring your attention to your sense of touch. Notice if you can feel even the slightest breeze moving by your face, your hands. Feel the touch of your clothes on your skin. Notice your feet in your shoes or on the ground. 3. Now change and bring your attention to what you can hear. Notice the sounds closest to you, hear some sounds further away and try and detect the sound that is furthest from you. Finally, spend a few seconds bringing your attention back to your breathing. Notice its natural flow. Feel the rise and fall of your chest. Then open your eyes and feel the refreshment... and continue with a deeper awareness into your day. Have a try of this. If you are an adult... see how it works with you in the next stressful moment. As a young person reading this, maybe if the ‘rents’ are getting on your back, I wonder if things might go differently for you next time you have a conversation that usually would end up being tense. David offered such a simple, yet profound, activity. Supported by many thousands of hours of his own stillness efforts, this enabled him to present a memorable moment for a workshop full of people. Each of us were given a practical action that we could take back to our corner of the planet. And where ever you are right now, this wonderful practice has reached you. May there be more David’s in our world who kindly encourage and offer something good.